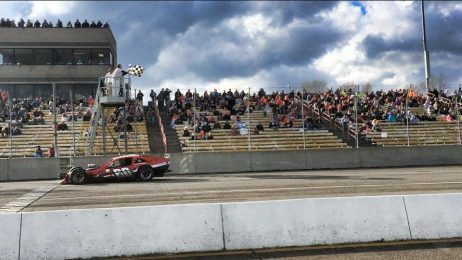 May 6, 2014 – Story, photo and audio by Race Chaser Online New York correspondent Steven Ovens – CHEMUNG, NY – They call him ‘Money Matt’ and on Sunday at the Chemung Speedrome, Matt Hirschman lived up to that nickname. Hirschman held off a talented field of Race of Champions Modifieds for the season-opening victory. The RoC Asphalt Modified Tour raced Sunday under blue skies with a minimal chance of rain all day. Track owner John White and Bob Stapleton were committed to getting the show in even though RoC promoter Andy Harpell admitted that he had tried to convince the speedway owners to pull the plug with how much rain had fallen Saturday evening. 24 strong asphalt modifieds came out to ‘The Drome’ and prepared for battle. They received 2 practice sessions to test and tune prior to qualifying. The field was split into 3 10-lap heats with 4 cars making the redraw. Matt Hirschman, Rusty Smith and Mike Leaty all took home heat wins. Leaty then had luck on his side as he drew the pole for the 75-lap feature. The Williamson, NY driver and Smith would lead the field to green while strong running Hirschman would go away from the fifth position. Leaty would lead the field to green but it wouldn’t take long for him to lose the lead. Bobby Holmes used a power move exiting Turn 4 and would go three-wide to take the lead to complete Lap 1 and would set the early pace. Leaty would fall back into the clutches of Hirschman and Smith before looping the L2 Auto Sport 25 and bringing out the caution on Lap 6. On the restart Hirschman was just too much for Holmes to handle and ‘Money Matt’ would take over the lead and set the tone for the rest of the event. The early portion of the race was littered with caution flags with several accidents and simple spins. Turn 4 was the problem corner for most of the event — the corner is a tight and close-quarters turn which requires cars to drive uphill on corner exit. Erick Rudolph and Chuck Hossfeld put on a great battle coming through the field. By lap 30 it was still Hirschman over Holmes, Hossfeld, Rudolph and Andy Jankowiak. On a lap 33 restart Holmes and Patrick Emerling, who had worked up to the top-10, would be involved in a crash that would essentially end Holmes’ day. It would also require Emerling to bring his 07 to the attention of crew chief Jan Leaty and crew. Mike Leaty, who started from the pole, would make several pit stops to try and adjust the car to compensate for a failure in the rear end of the 25 machine. Rudolph would also have his problems on the Lap 33 restart as he would suffer a right front flat. He would recover to a 7th place finish. Up front though, it was all Matt Hirschman the rest of the way. Local star TJ Potrzebowski was putting on a show coming from the back to 4th place, however his day would end with a spin off the front bumper of Austin Kochenash relegating him to a 13th place finish. There was a caution with 9 laps to go but the slow laps did not slow Hirschman down. He would pull away to a 3-5 car length lead over Hossfeld at the finish, Kochenash had to settle for third while Brian Defebo and Jimmy Zacharias completed the Top-5. Daren Scherer finished sixth, followed by Rudolph, Jankowiak, Brandon Oltra and Emerling. The next event on the ROC Modified Tour is Sunday May 18th at the Shangri La II Speedway in Tioga Center, NY.